Many Americans don't have first-hand experience with Israel or the Middle East and what knowledge they do have of is often gleaned from the nightly news, which spotlights the strife that often occurs, as the region is a global hot spot where the three major monotheistic religions converge. Israeli metallers Orphaned Land are living, metallic proof that the arts are thriving in the Middle East -- and that you can't always trust or discern the truth from news media sources. 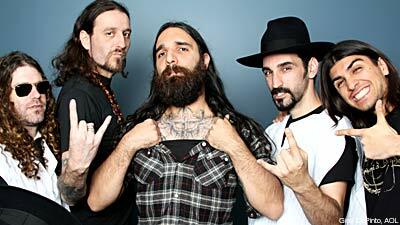 "Tanks and soldiers get more ratings than nice places, metal concerts or good news," vocalist Kobi Farhi told Noisecreep. "It's partly true that it is a terror zone, but it is amazing, culturally and musically speaking. It is full of inspiration and Orphaned Land can only emerge from the Middle East, and particularly Israel, as it is the only democracy around, where there is the ability to think freely and speak about whatever we want without being arrested. We feel that we contribute a Middle Eastern flavor to metal." Farhi and Orphaned Land -- who were visiting the U.S. for their first tour and enjoyed their first New York City show at packed BB Kings in Times Square earlier this month -- liken their home turf to America. "I live in a multicultural place, where the three Abrahamic religions are strong in daily life and the Jewish nation came back to Israel after being spread around for 2,000 years," Farhi said. "There are Moroccan Jews, American Jews, Asian Jews and Judaism is the only thing that unites them. Everyone brings their own mentality and habits, so it is multicultural. The U.S. is the same, as a country of immigrants, and you feel it in New York." Guitarist Yossi Sa'aron Sassi also sees Israel as a place where the past fuses with the present and future in a profound way. "You can see a McDonalds and the old city of Jerusalem in the same shot, and it all blends together," he said. "We want to illustrate and exteriorize the richness coming from our region. 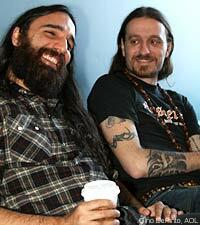 We feel like we are ambassadors of our region, of the Middle East and are de facto pioneers of Middle Eastern metal." Orphaned Land's 'The Never Ending Way of ORWarriOR' is out now.